Yes, it's time for that no-good self-promoter and Lifestyler wannabe, the one, the only ... me ... to return with some serious chatter involving the company you obsess about and the business Disney is in. Topics to be discussed will be SDL, TDR, D23 Expo, Mary Sklar and how they all connect with WDW. If you want to talk about how much you love BB-8 or Thor, want to discuss box office of various summer films (money and popularity does not equate with quality as examples like Walmart, McDonald's and Starbucks prove every day) or talk about how both Bob Iger and Donald Trump are better human beings than Walt Disney, this isn't the place for you. So just leave. Now. I'd simply ask that people stay on topic and report posts that go way off. This forum is a mighty big place and there are plenty of other places to discuss why charging for FP (what IS coming to WDW) is simply good business. And with that we are off. I have spent a lot of time this summer at Disney's international outposts in Paris, Shanghai and Tokyo, so not able to buy the suddenly available GMR and UoE merchandise that was never available before. I did return briefly with Paris thoughts earlier this summer and think I"ll leave Paris for the D23 chatter as it was telling that almost nothing was discussed about the resort's future. I know I am considered a critic of SDL and that is true, but I greatly enjoyed the park. BUT in no way would I advise American fans to visit it as their first international destination. I have always said DLP should be first, followed by HKDL and TDR. I still believe that is sound advice and would place SDL last to visit. Not because it is bad. But because it still China and very foreign and the most culturally foreign (yes, I know arguments can be made about Japan, but those can be off-set by the amazing quality of the product and the service you get in Japan). First, let's get this out of the way. SDL has a different feel than any other castle park in the world. And it isn't in that crazy fanboi from the east visiting DL for the first time and saying "I didn"t feel any MAGIC. The castle was tiny. And there was no Peoplemover too!" 2.) It has no natural flow or feel whatsoever, despite spectacular theming in parts. It feels like it is a showcase of Bob Iger's IP that Disney wishes to sell to the masses of the mainland because that is exactly what it is. That castle that people have debated all over the Disney Twitverse can be beautiful from certain angles, but largely is as ugly as you might think. The size and scale are off, purposely. Why? Because the Shendi 'partners' demanded the biggest and most ostentatious castle for bragging rights. If you think size is everything, and some fanbois surely do, then you'll likely have no issue with this. I found the castle to be much nicer internally, from the criminally underrated Show White walk thru attraction (one that requires climbing more stairs than the average WDW Guest likely climbs in a month) to the shop to the mosaics representing various Disney princesses. Storybook Castle is the perfect metaphor for SDL. It is large. It is loud. It is imposing. And it attempts to demand your attention versus the seduction in other castle parks. I get that Bob Weis and his largely Chinese design team were given a specific brief where everything (or almost) had to be a world or Asian exclusive (recall that"s why Disney ignored the Pooh dark ride clone). I get that they wanted to do a different take on a castle park. I get that they wanted to leave plenty of room for expansion. But there are many ways to accomplish the feat and SDL is a very mixed bag (sorry, Dakota! more sorry that Disney hasn't hired you!) that doesn't work well as a cohesive whole. I have never walked so much in a castle park as I did in this one. Unlike other MKs, this one doesn't feel logical and the ability to get one place from another isn't as easy as it should be. Quite frankly the design and layout of the park are lousy. And the capacity isn't what it should be for the crowds that pour in. Some advice: don't go in summer and don't go the week before prices go up. Adventure Isle and Pirate Cove are top notch in immersive theming, details and landscaping. Some people say they are TDS quality. I think that's debatable, but I can easily argue it both ways. The other lands don't come close to measuring up. Fantasyland ... well, let's wait. Why don't we start with the good, the bad and the ugly (or strange or weird or bizarre)? What's good at SDL is, indeed, very good. I am tempted to say that it is worth flying over just to experience this attraction and marvel at its brilliance. All I can say to my UNI pals is THAT is how you use screens. What an amazing combination of different mediums to take you on a cohesive adventure. The problem with using is screens is that, inevitably, they end somewhere and you find yourself looking at a black wall or ceiling etc. That doesn't happen here. When Jack Sparrow and Disney's new ride system send you to the bottom of the sea, that is where you wind up and the illusion is very successful. Easily one of the best attractions in the world today. How about those other E-Tix? Tron, since that is on a lot of folks' minds recently, is also a great ride. But ... it has shortcomings. First and foremost are its length. Too short. You can also tell where Disney cut the budget and the result is painted flats when there should be projections or other effects. It is still fun as can be. One of my few regrets from the visit was only being able to ride during the day. As to how it will work at WDW ... let's circle back to that later. Roaring Rapids is another exclusive and the fact I loved it should tell anyone how successful the theming and ride itself are because I hate raft rides as a genre and view them as quick thrills and below what Disney should be doing. Riding only at night with lighting and fog effects made the experience greater, I am sure. But also there's that giant 'alleged' AA ... that you come face to face with (depending on where you are on the raft and where you are looking) ... and that is something we need to come back to on ... the bad. Even Soaring got plussed a bit for SDL. The queue is certainly the best out there. And the scents all work as they should (but haven't in Anaheim and Orlando on about 15 rides from last fall to this spring). The CGI pyro added at the end over downtown Shanghai is amusing. Attractions like Peter Pan and Buzz Lightyear are both substantially upgraded to the point where one might consider them D-Tix in SDL. Of course, with today's technology, they should be. Buzz was one of those surprises of something truly much better than originally anticipated. Shows and live entertainment are wonderful largely. The daily parade, Storybook Express, is quite nice with creative floats and a catchy soundtrack ... that is fine until you see Happiness Is Here at TDL about five days later and totally forget the former. The standouts for me were the Tarzan acrobatics show and the Pirates stunt show, which interestingly uses music from the original attraction while the new attraction strictly uses the scores from the film series. I didn't see the Frozen show or the Ignite The Dream projection show. The latter was because I had seen Disney Illuminations at DLP three times and knew that ItD was about 90% the same. Detailing is good across the park, but much more so in Adventure Isle and Pirates Cove (or Adventureland 1 and 2 as I call them). Sure, there's plenty on tiny Mickey Avenue. But it seems forced and largely for egos at WDI to show they know some obscure character or 1940s cartoon short. CMs were absolutely wonderful. Everyone we dealt with at the resort was either completely fluent in English or knew enough. And they were so friendly and proud to work for Disney, something that used to mean something in Orlando ... back in 1987. We found ourselves talking longer to CMs because it was so pleasant. I may have even done something I haven't done in many moons. No, not that. Pin trading. Before I left for Europe, I went to the local Disney outlet and got a bag full of Marvel and Rogue One pins at 99 cents a piece. Amazing what a Doc Oc pin has for value over there ... wound up with grand opening pins, LEs that had just come out and sold out and some HKDL designs too. Toy Story Hotel was a wonderful place that surprised me. It is as ugly in reality as it is in pics. But inside, it has a fun and warm vibe and really is impeccably maintained. Now, should it have been the priciest hotel of four in Asia that included four star hotels with one bordering one five? Of course not, but this is Disney. The beds were the most comfortable I think I have experienced in the mainland and the AC was great on days where the temp was around 90 with humidity that makes Orlando look cool. We were lucky, though After we left, there was a period of over two weeks where the temp was over 100 every day with feels like temps in the 120s. I have no idea how you function in weather like that at all. Transportation was a breeze with great bus service. I don"t think we ever waited more than five minutes. None of that standing crap from WDW either. Food is always an important topic and I wish I had more to say on the subject, but because of the shortness of the trip (we had two full days in the park and a half day at Disneytown) and the heat, we didn't eat like we normally would. We took every blogger's advice (shoutout to my hero and Disney Blogger to the Stars, Tom Bricker, AKA @WDWFigment) and had our first meal at Barbossa's Bounty. I had steak with rice and corn on the cob. My beautiful other half had ribs. We really enjoyed the food. I believe the meal was about $12 a person (but before anyone talks about it being a great deal, think of your audience ... people there do not find those prices cheap because it would be more at EPCOT ... it"s like telling a minimum wage CM at WDW that they should go to Whole Foods to shop ... not reality!) You do have a small view in one rooms of the Pirates boats starting their journey. But it isn't like a Blue Bayou deal. There was some ugly here that will come in a later post. The only other QSR locale we had meals at in SDL was Remy's on Mickey Ave., a location that serves until 11 p.m. when the park closes at 10. The sandwiches and baked goods were outstanding. And sitting on the patio watching the lighting on the castle is a great nightcap, even if you don't find the castle as pretty as a New Jersey fanboi who finds Chinese food, Americanized Chinese food, scary. Meals at TSH were also terrific. Had meals at both the grab and go, which also has seating, and the buffet at the cafe. First thing's first, the salted caramel cookies they serve are the absolute best cookies I have ever had at any Disney hotel or park anywhere. The buffet is almost entirely Chinese items, from dumplings to meats to noodles, but was very, very good. The buffet didn't include drinks and there is an awkward process to buy them as they are in a freezer in the buffet area (near one with the desserts that are included) with a CM standing guard to make sure you don't grab a Pepsi or 7-Up and walk off. Finally, we had a meal at the Boathouse, which looks like it will close shop. For whatever reason, everyone heads into either the park or the main part of Disneytown. The Boathouse sits on the spit of land that juts out toward the SDLH and Wishing Star Lake. Nothing in that wing, even the Disney owned and operated shop that sells Marvel and Star Wars toys, seems to be able to get people to walk that short distance. Again, I'd suggest the design and master-planning of the area was lacking. The food at The Boathouse might surprise any westerner as while the interior looks like a slimmed down version of Orlando, the menu is 100% Shanghai cuisine. No token burger or chicken sandwich (which you NEVER order in China!) or salad. Nope. But amazing pork and veggie dumplings, wonton soup, noodle and other dishes. Oh, and all for slightly more than the price of whatever the cheapest sandwich on the Orlando menu is. Great to have a new thread, Spirit! Thanks! Next post will cover some of the bad of SDL that might give you pause before planning a visit or, at least, will give you more of a full picture. Thanks for reading and Happy Late Summer! Awesome new thread. Thank you! Since Spirit seen Happiness Is Here. Here's a good video of the parade for those that never seen it. I love how some of the floats feature Disney characters and films that are hardly seen in the other parades af the other parks let alone a float dedicated to them. I especially loved The Aristocats float. Since Spirit seen Happiness Is Here. Here's a good video of the parade. Will get to this in the Tokyo part of the tale ... but absolutely love it and you must be channeling me as I bought the CD and was playing it in the car a few hours ago! BTW, parade will be going away in 2018. If it were the MK, it would play for ... how many years did the the snowglobe parade go on? I liked this before I even read it since I knew it was going to be a well put together, informative post. I'm looking forward to the bad since I've heard a lot of very mixed opinions about SDL. I like the recommendation about going to DLP first then one of the asian parks. TDL has always caught my eye more than DLP, but it makes sense going to a "less foreign" park first. I'd volunteer myself to get you the UoE and GMR merch but I don't even know if I'll be able to get it this weekend. I'll leave the offer there in case I do get it. One thing I forgot to mention prominently in the post above was how SDL really does the small scale attractions so well. My first attraction in that park was Alice's Labyrinth and I haven't seen a report on how large it actually is or how nice the projection scenes are. The Once Upon a Time walk-thru in the castle, is such a beautiful little attraction that tells the tale of Snow White. ... And while I didn't get to do the Pirate Cove walk-thrus, I have heard very good things. These are things that DLP does great and the MK ... the MK doesn't do at all. thanks for reminding me about this parade, I just pulled my CD back out too . Too bad this cant come to MK, festival of fantasy is hodge podge and does nothing for me. Glad to see a new thread! My opinions are mixed because the product is decidedly mixed. But you gotta love new theme park smell. That said, yes, I agree with the less foreign analogy with DLP. There is so little foreign about it at this point and the park really looks good. It is also an 'easy' first international park to do because it doesn't require uber planning. But if your doctor said you have six months to live and you could only visit one, then I would tell you to go to TDR and see how it should be done, how it is supposed to be done, how it once was done in the swamps. Thanks, but I have people who can get me things. That was largely sarcasm because if you hate that Disney is destroying two great 80s attractions that could be made great today to shove in quick IP hits, then you shouldn't be rewarding them by buying stuff that commemorates their current business model. Looking forward to your Tokyo thoughts. I'm really wanting to take the family there in the next couple of years. Also, I cannot agree with the comment about Walt, even though I am well aware that he's not the perfect human being just about everyone sees him as. The company has done an excellent job shaping his public image as a near-immortal being. Most everything else I agree with or enjoy reading, and look forward to more. That's what I've heard about TDL, it's ran right. I swear SEA is what happens when imagineering is given as much $ and is told to make something amazing. I want to see something other than WDW so I'm aiming for DL in the next year hopefully and then off to DLP at some point. I'm just tired of seeing WDW being neglected. And understood. (Go ahead and laugh) I take the same stance on gaming. I don't reward bad practice and am extremely tight with my money, but donate and buy extras for good devs in the market...which there aren't a lot of anymore. The only reason why I want the merch is mainly due there not being much of it when UoE was "alive". At least from when I started going yearly in 97. But I can guarantee that I won't be buying any GotG crap. Tron on the other hand... you got me Disney. Can't wait to hear Spirit's thoughts on the Tokyo version of the Pooh ride, and Dreamlights. I wonder if he also rode Ride and Go Seek? But especially Hunny Hunt, unlike the Pooh clones found at the various Disney Parks. Tokyo's actually made me feel like I'm in the Pooh Universe because of how convincing the AA's and ride design is. DLP was popular from the start. It immediately became the top tourist attraction in Europe upon opening. The popularity issues you are speaking of were related to cultural elitists, same people who didn't want McDonald's and Starbucks etc. But there were financial issues with Euro Disney immediately due to overbuilding of hotels and underspending of Guests as well as an economic downturn. SDL has also been popular from the start. I said in the last thread and will repeat here that Disney lies -- lies a lot -- but I absolutely believe the attendance numbers the new park is pulling in. That said, it is very pricey to many of the Guests (the low ticket prices are based on American opinions as to what theme parks cost here ... SDL can't charge those prices), which results in people bringing in all sorts of food and people actually inside the park selling counterfeit Minnie ears and cheap ponchos. But SDL has major capacity issues, which I intend to get into, and those won't improve for years. Toy Story Land is not an expansion. It is an originally intended build that was put off when the construction became so behind schedule. This is a park that needs two major E-Tickets with fairly high capacity and two more C-D Tickets in additions to TSL rides. As to people knowing Disney characters, it really depends. Some who are truly middle or upper class do have knowledge of many characters. Others who may live 300 miles from Shanghai have no clue what a theme park really is (or how to behave in one, which is again something I intend to discuss). 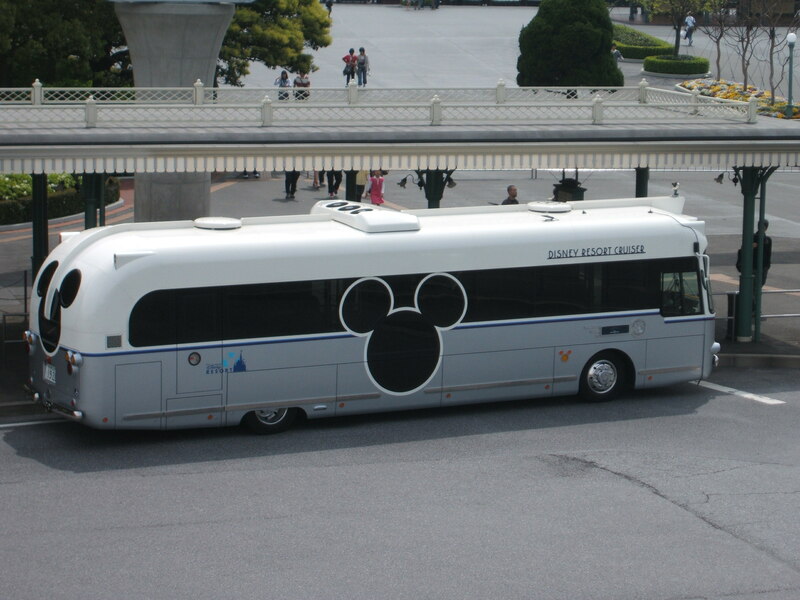 I really love how the Tokyo Disneyland Bus transportations are designed compared to the ones at WDW and Disney Cruise Line. This is the type of stuff that I wish WDW did instead of well this.